GOES-16, the first satellite in the GOES-R series, launched in November 2016 and now provides 16 multispectral bands of satellite data, including CONUS scans every five minutes, with 0.5 kilometer visible imagery resolution and 2.0 km longwave infrared resolution. This lesson harnesses GOES-16’s increased temporal and spatial resolutions to identify convective development and intensity signatures on traditional longwave IR and visible band imagery, and compares the experience to using legacy GOES products. The lesson is geared toward early-career forecasters, those forecasters wanting more experience using high-resolution satellite data to forecast convection, and will be useful to aviation forecasters, meteorology major students and instructors, and weather enthusiasts. This was very relevant to the field of operational meteorology. I found it interesting and almost feel sorry for GOES 15 b/c I knew 16 was a lot better but the side-by-side comparison really drove the point home. It would be niceto have if a link to a youtube video for some examples. Very informative. I experienced this weather event from the ground when it occurred. Interesting to go through the information as it related to an event such as this. I had a little trouble identifying some features like cumulus cloud streets at the beginning. I know you guys showed examples, but some more verbal pointers would have been helpful as well. Otherwise, it was a good exercise. A great review on using satellite for convective interpretation! And this lesson really pointed out the advantages of GOES-16 over older satellite technology. This lesson product provides very relevant and enlightened understanding of the vast GOES-16 improvements with both frequency of observations and imagery resolutions (both visible and infrared). While I'm sure we all expected the data products to improve immensely, this lesson package permits the 'player' to compare and contrast with a wonderful real-time weather event. Clearly displays the operational enhancements that GOES-16 (R) provides in comparison with "legacy" GOES satellites. A "must review" for anyone involved in convective forecasting. I found the lesson informative and that I didn't know quite as much as I thought I did about convective signatures in satellite imagery.It doesn't really matter much to the lesson but was the GOES-16 imagery presented parallax corrected? Features on it appeared in a different spot than in the GOES-15 imagery that was parallax corrected and that threw me off a little. Help me a lot to understand. Well done course! Thanks. Great module! 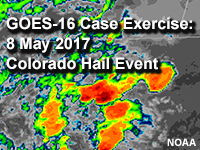 I would like to see more case example modules with GOES-16 in the future. Identify common convective development and intensity signatures on longwave IR and visible satellite imagery. Observe the difference in resolution between new GOES-16 and legacy GOES-13/15 visible and infrared imagery, and be able to describe convective signature advantages that GOES-16 provides.